Apk Share Bluetooth is a app manager that helps Share , Uninstall , Backup and Manage. It also gives you information about app sizes for transfer. App will help you to find last installed, more size applications and Uninstall it easily in one click. You can also manage system apps, but without root permissions it’s not possible uninstall it. Bulk Apk Backup to SD card. FREE UP your device storage! Faster & Smaller. Multiple Apk Share – Transfer apps over bluetooth, email ,Facebook, Whatsapp etc. 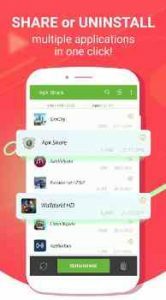 Multiple App Uninstall – Easy Uninstall multiple app faster in one click. Fast apk uninstaller. Multiple App Backup – Save multiple apk to SD card in one click. You can not uninstall system application if root permissions does not exists. If you are not seeing app on list, try to use Show System Apps option. We are trying do best for you! Why I not see some apk on list? Can I Share Apk to non Android devices? Do both people need the app? How I can backup all app to SD card? How I can find more sized applications ? Use Sort By Size. You can change sort direction in twice click. How I can find recent installed applications? Using this apk uninstaller you can delete only downloaded applications. System app can not be uninstalled. But if you have root permission, then you can delete apk easily using uninstall button. really amazing and works perfectly. It’s serious. Best app sender via anything!!! Trusted app if you want to share something with your friend. I’ve already try it and it’s work!!! I’ve been searching for an APK extractor with a Batch Mode so that I don’t have to select each of my 121 apps to save separately. This has the next best thing – a Select All facility – so I was able to save all my APK files. A true Batch Mode would be better, then I could just select the ones I want, but I managed with this. Before I loved it very much but all of a suddenly it keeps interrupting on my screen with a notification that Bluetooth Share Keeps Stopping.Even when I select close app the notification pops up over and over again. What should I do coz I’ve even tried uninstalling but sama issue. Very useful and easy to use. It does exactly what it’s supposed to. Definitely a must have app! Amazing app I loved it. Transfer app in apk shape it’s Easy, practical and simply. Thanks my dear developer!